We provide for Tempo Service from Mumbai or Nearest Mumbai Area to all over India. We provide for All type tempo as Small Tempo, Big Tempo.Medium Tempo, Open Body Tempo, Closed Tempo etc. from Mumbai or Nearest Mumbai Area. 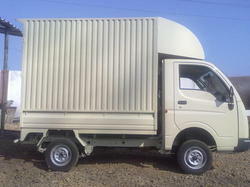 We also provide tempo service outside Mumbai area to Mumbai or anywhere India. So as to meet the varying demands of our customers, we are involved in providing Tempo Services. Due to their usefulness and extraordinariness, this service is hugely in demand. Furthermore, this service is rendered as per the demands of esteemed customers to gain their maximum contentment. Being one of the renowned enterprises, we are engrossed in presenting Tempo Goods Transport Services to meet the detailed necessities of our clients. Provided services are delivered under the guidance of talented executives. Moreover, these could be modified to match with the varied desires of our patrons to accomplish their trustworthiness. We provide reliable and consistent Logistics, supported with 160+ Trucks and Trailers of own Fleet. Our company has mastered the art in providing Tempo Transport Service.